Without guru devotion, nothing happens—no realizations, no liberation, no enlightenment—just as without the root of a tree there can be no trunk, branches, leaves or fruit. Everything, up to enlightenment, depends on guru devotion. This book presents extensive teachings on guru devotion by Lama Zopa Rinpoche, a contemporary exemplar of the practice. Rinpoche explains the importance of the spiritual teacher, advises the correct way to develop a student-teacher bond, and offers commentary on each traditional guru devotion sub-topic found in Lama Tsongkhapa’s lam-rim. Drawn from more than fifty teachings, this book is the result of seven years of editing by Ven. Ailsa Cameron. Order a print copy by clicking the Add to Cart button on this page. You can also order a paperback copy from Amazon, or visit your favorite ebook vendor using the links below. You can read excerpts from this book online. LYWA Members can download the ebook for free from the Members Area. 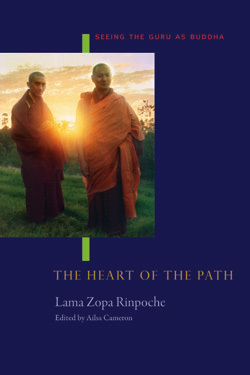 Special price for LYWA customers: The Heart of the Path retails at US$20 per copy but we are offering this book at the special price of $15 to customers who purchase it directly from us.